The models took the runway together at the end of the show. The inspiration for ART reFASHIONED was paper doll fashion on porcelain dolls. Galerie 103 celebrated the creative minds of Kaua‘i, O‘ahu and Mainland artists with a humorous fashion show in its new location next to Merriman’s at The Shops at Kukui‘ila in Po‘ipu June 13. 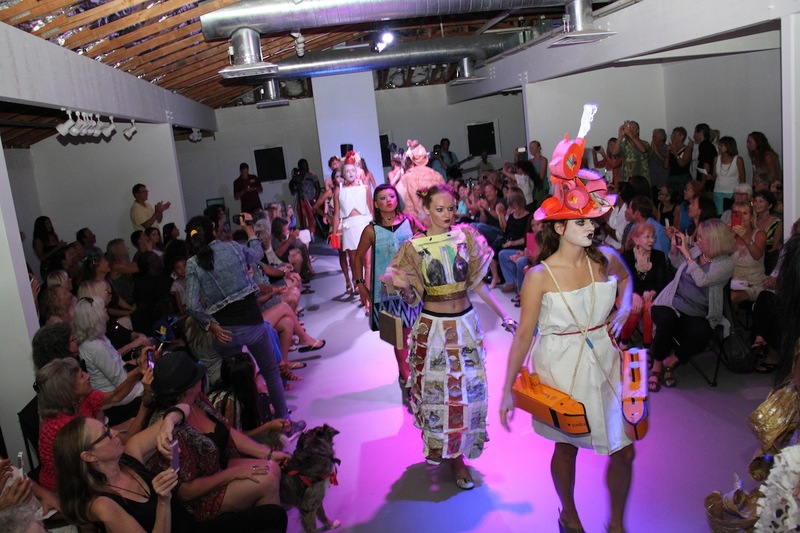 Following last year’s success of ART reFASHIONED, Galerie 103 owner Bruna Stude said she wanted to continue the fashion show as an annual tradition. So she got more than a handful of artists together to throw reIMAGINED PAPERWORKS. The inspiration for the show was paper doll fashion on porcelain dolls, and the material used were shopping bags, cardboard and other types of paper. PowerHound, a Kaua‘i musical group formed 10 years ago with the mission of playing music differently, improvised a sonic landscape for the evening. Galerie 103’s next exhibit is David Kuraoka and Tom Lieber, from July 11 to Sept. 5, with the opening reception July 11, from 6 to 8 p.m.
Visit www.galerie103.com for more information. Artist Carol Yotsuda, center, and two models wearing Yotsuda’s creations. Artist Sally French, center, and two models wearing French’s creations. Artist Sally French, left, and a model wearing French’s creation. The inspiration for ART reFASHIONED was paper doll fashion on porcelain dolls.